In 2011, the International Water Resources Research Institute (IWRRI) was established for 1) serving as a center of experts in the water resources field, 2) solving water resource problems, and providing better education, research, planning and community services, 3) assisting public and private interests in the context of conservation, development, and use of water resources in South Korea. The IWRRI signed MOU with 12 countries to promote education, innovation, leading research, high technology, and public services provided by experts and researchers together with international partners from around the world. The IWRRI are playing an important role in not only interdisciplinary researches but also personal exchange with other countries by producing international students. The IWRRI has research, management, international relationship and public relationship divisions. The mission of our institute is to create an innovative solution satisfying the needs of social and to support the provision of technological challenges of the future. Kangwon National University is one of ten core national universities located in Chuncheon, the capital of G(K)angwon Province in Korea. Korea has a juridical system with its eight provinces and two metropolitan cities, each of which has one of those core national universities. 1947 Established Chuncheon Provincial Agricultural College (of G(K)angwon Province) -1952 Changed the College name to Chuncheon Agricultural College. Our ideal education is the realization of education in the spirit of Sil-Sa-Gu-Si(Inquirere Veritatem Ex Praxe), a proverb meaning "seek for the truth from reality, seek for the very truth to enable us to renovate the world as it should be from the world as it is." For the century to come, we will devote ourselves to proliferate knowledge and facts. We will make headway withSil-Sa-Gu-Si to implement a true education. The Convergence Research Center for Disaster-Hazard Resilience (CRC-DHR) aims at developing a sustainable research infrastructure that will provide cutting-edge solutions for each stage of natural/man-made disasters and hazards in order to maximize the society's disaster-hazard resilience, and producing high-quality human resources for the next-generation convergence research. School of Urban & Environmental Engineering in UNIST has three major tracks. One of them is the Disaster Management Engineering track (DME). DME provides an interdisciplinary undergraduate education, integrating the diverse expertise of urban/civil engineering, environmental engineering and earth/climate engineering to mitigate the impact of unexpected disasters. 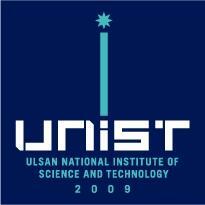 UNIST is a warm and welcoming post-secondary institution located in the heart of Korea's largest industrial city, Ulsan, South Korea. Since its opening in 2009, UNIST has truly become one of the world's leading science and technology universities. UNIST aims to be ranked within the top 10 science and technology universities by 2030.